All of Andrew Jackson’s papers located by 1987 have been microfilmed in one of three places. In 1967 the Library of Congress in Washington filmed its own Andrew Jackson collection—the largest single holding in existence—on 78 reels. Many Jackson documents are included within the various sequences of federal government records held by the National Archives and Records Administration in Washington and filmed on its M and T series microfilms. Lastly, in 1987 The Papers of Andrew Jackson issued a 39-reel microfilm Supplement, comprising all known documents that had not already appeared on the Library of Congress or National Archives films. Simultaneously the project compiled and issued a combined alphabetical author/recipient index to all three film series. Its pages may be accessed below. 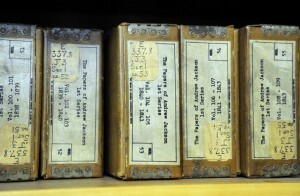 It locates each document by series and reel number and also, within the Supplement film, by frame number. Although essentially a listing of document authors and recipients, the index also uses a few subject headings for items, such as memoranda, to which no personal name can be readily attached. Users should be aware that a heading such as “Bank of the United States” by no means embraces all the documents pertaining to the subject. Entries with a microfilm citation beginning with DLC- refer to documents housed in the Library of Congress’s Andrew Jackson Papers collection. That collection is now available online, but please note that the indexing terms and dates used to arrange that collection differ in many cases with those found in the links below. In most, but unfortunately not all cases, DLC- items can be found by searching the website with the recipient/sender’s name and/or the date of the document.